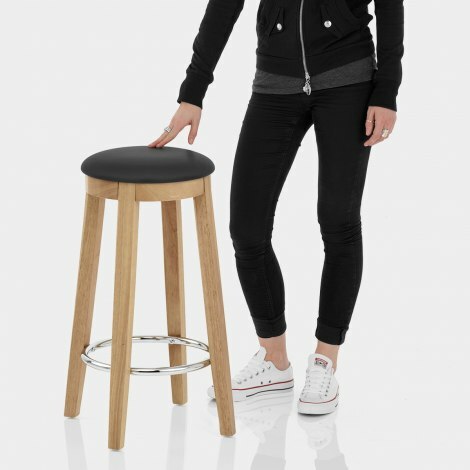 A classic design with a fashionable modern makeover, the Ikon Kitchen Stool Oak & Black is a great multi-purpose piece that is sure to enhance its surroundings. Adding panache to old and new spaces alike, the Ikon Kitchen Stool has plenty to offer. Fabulously compact, the beauty of its backless shape means it can be stored beneath the worktop overhang when not needed. Offering quality comfort, the trendy black faux leather seat is nicely cushioned, sat atop a solid wooden frame that is both rustic and reliable. With an attractive oak finish that will match beautifully with other oak furniture, the four legs descend to the floor with a light taper. Plus there is a mirrored chrome bracing bar midway down which doubles as a practical footrest. Last but not least, protective pads on the underside of the feet making it suitable for a myriad of floor surfaces, ensuring the Ikon will not disappoint. 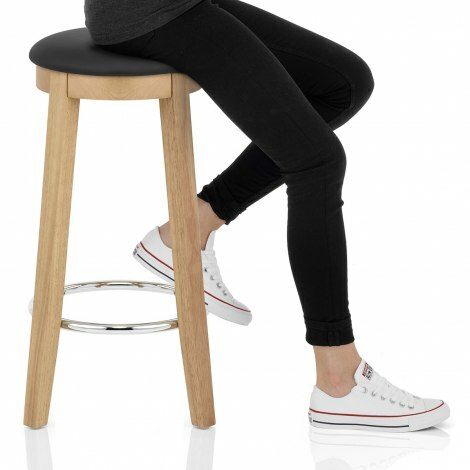 "Very pleased with everything about these stools"
The Ikon bar stool ordered was easy to assemble and great quality. The service from Atlantic was peerless. Sturdy stools and look good too. Great product looks good in kitchen very comfortable. Very pleased with the product and the delivery service. Have not got around to assemble these stools as yet but looking at them inside box ok.